The first principal was W.W. Trent, of Barbour County. He later served as state Superintendent of Schools for a number of years. In 1940, the first Third Ward School Parent Teachers Association (PTA) was organized with Wilbur Coontz serving as the first president. The PTA began holding school carnivals as early as 1969. In the spring of 1971, the foundation of the old Third Ward School building was declared unsafe. Classes were held in the National Guard Armory for the rest of that school year. Tests later showed that the school was built on solid rock, so it was still safe. Parents helped clean up the old school before the students moved back in the following year in the fall. The new Third Ward Elementary School was built on Nathan Street in 1976-77. There was a dedication ceremony on October 31, 1976, featuring the Elkins Junior High School Band, under the direction of Howard Kittle; and the Third Ward Elementary School choir, directed by Linda Wagner. The new school was occupied over the Christmas break in 1976. The old school building was sold at auction in June 1977. The building was renovated in the 1980s. It is now being used as apartments. The school formed its own Parent Teacher Organization (PTO) in 1984, the first of Randolph County Schools to do so. The PTO is quite active, having well attended monthly meetings, various fundraisers, finding volunteers for TAP (Teachers Assistance Program), and maintaining and improving the school playgrounds. Third Ward School has undergone a number of changes over the years. Two new rooms were added to the school in 1987 to provide better facilities for the special education classes. At one point the entire back playground was dug up; trenches, drainpipes and topsoil were added so the field would dry out more quickly after a rain. The school's first computer lab was formed in about 1999. The original carpet was removed, and classroom and hallway floors were tiled in the first years of the new millennium. New playground equipment and an outdoor pavilion were added in 2006, along with a walking track. Several major events have happened recently in the history of the school. 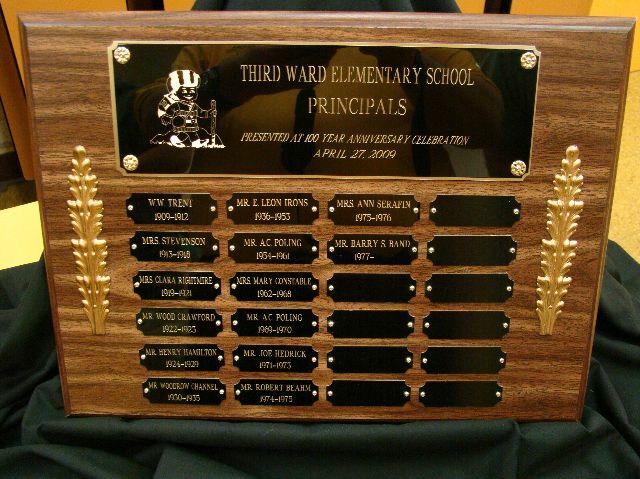 In the spring of the 2008-2009 school year a 100th Birthday Celebration for Third Ward School was held. Past and current students, parents, teachers, and administrators attended as well as community members. The school's choir and band performed under the direction of music teacher Dr. Scott Green. installation of a new sprinkler system and fire alarm system, replacement of the HVAC systems, replacement of the lighting systems, upgrades to the electric and data wiring, security, technology and communications systems, replacement of toilet partitions and some plumbing fixtures, replacement of ceiling systems, replacement of floor finishes, painting of walls, and replacement of some doors. Classes continued to be held in the building during the renovation. Thanks to the renovations, Third Ward Elementary School will continue to be a "School for the Children of the Community" for years to come. all members of the organization are responsible for increasing academic rigor in order to enhance and improve student growth. high expectations for all students, staff, parents, and community result in increased student performance. student learning should be focused on the approved Next Generation Content Standards that will prepare students for college or career readiness. all members of the organization are responsible for building positive relationships with students, parents, and community members in order to enhance community connections. We believe that children need outside activities to grow and mature. We encourage them to take part in these and other activities. Information is available in the school office for any and all of the following activities. During the year, we will also announce sign up times for soccer, baseball and other community sports teams. Our partners provide special support to our school. Each partner has a special role.